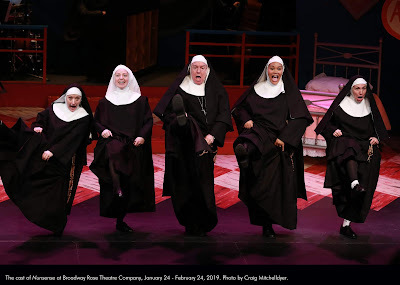 Westside Theatre Reviews: Broadway Rose’s Nunsense – Glorious Nonsense! Broadway Rose’s Nunsense – Glorious Nonsense! Remember the good old days, when a musical comedy was a comedy with lots of music, and a good musical comedy was a really funny show with lots of really good music? By this rather antiquated standard, Broadway Rose Theatre Company’s production of Nunsense is a really, really good show. Fortunately, I am a rather antiquated reviewer. Truth be told, I have sometimes been underwhelmed by the sequels in what has become the Nunsense franchise, so seeing the original (for the first time!) at Broadway Rose was a real eye-opener for me – the show is utterly charming, witty, and flat-out hilarious. Director Sharon Maroney made some spectacular casting decisions, undoubtedly helped by the fact that the company’s sterling reputation generally gives them access to the cream of the region’s musical theater artists. However, Maroney didn’t have to look far to find a surprising, and surprisingly effective, Reverend Mother (aka Sister Mary Regina) – her husband, the inimitable Dan Murphy. The premise is that a group of nuns from the Little Sisters of Hoboken convent are staging a fundraiser. The convent ran into serious financial difficulty when Sister Julia, Child of God, inadvertently poisoned 52 nuns with a bad batch of vichyssoise. They sold greeting cards to raise money to bury their unfortunate sisters, but when the Reverend Mother spent part of the money on a 70” TV they came up a bit short, and were forced to store the last four nuns in the convent freezer. It is abundantly clear that the health inspector will not approve. Under the directorship of the Reverend Mother, four talented nuns (second in command Sister Mary Hubert, Brooklyn born wisecracking Sister Robert Anne, the mysterious Sister Mary Amnesia, and novice Sister Mary Leo) are putting together a benefit variety show (on the set of the parochial school’s upcoming production of Grease) to save the day. The show is packed with nun jokes, of course, and thus especially funny for practicing and lapsed Roman Catholics with a high tolerance for irreverence occasionally verging on questionable taste, but it’s also loaded with truly boffo secular humor – who can resist lines like “for 52, bon appetit was also bon voyage”? Add in some pre-show jokes and an audience quiz (with cool prizes like a St. Christopher medal, mass cards, even a Pope-on-a-Rope) and the stage is set for a couple of hours of seriously fun theater. The role of second in command, Sister Mary Hubert (the only nun whose aspirations are more religious than theatrical), is ornamented by the elaborate vocal stylings of Antonía Darlene, who is solid throughout but simply soars in Act II’s “Holier Than Thou.” Broadway Rose veteran Laura McCulloch uses her fabulously mobile face and huge eyes to create a truly memorable Sister Mary Amnesia, she nails her solo star turn in “I Could Have Gone To Nashville,” and her “duet” with the puppet Sister Mary Annette (“marionette” – get it?) is the cherry on top of her performance. Last, but by no means least, is Malia Tippets’ attack on the role of the naïvely optimistic Sister Mary Leo, who believes that she is destined to be the first nun/ballerina. She is a delight throughout, and proves in her heart-wrenching “Dying Nun Ballet” that tutus are optional when God’s on your side. Costume designer Grace O’Malley’s job may have seemed simple – after all, it’s just a bunch of habits, right? However, these particular habits give lots of room for dancing, space for hidden puppets, a Flying Nun headdress, and other surprising qualities not found in the average convent attire, and really add an extra dimension to the show. Special notice is also due to Jeff Forbes’ lighting design, as well as the skilled spot light operators (student interns Amy Beery and Isaiah Hollingsworth), whose creativity, timing and precision are essential. Warning – the word is out, and many shows are full or nearly so – ticket buyers should consider non-weekend performances and move quickly! Nunsense is playing at Broadway Rose’s New Stage, 12850 SW Grant Avenue, Tigard through Sunday, February 24th.